Bill Shaffer, state program administrator principal for the Minnesota Department of Public Safety, will be the headline speaker. Shaffer will address an estimated crowd of 5,000 motorcyclists about Minnesota’s new Road Guard Certification program, which trains riders how to stop and control traffic for motorcycle groups. He will speak at 11:00 am. Sat. Owen Riess, author of “La Ropa Sucia”, will speak at 1:00 p.m. Sat. and 11:00 a.m. Sun. about the “Do’s and Don’ts” of riding in Mexico. Tim Hyma, Executive Director of the Sparta Area Chamber of Commerce/Driftless Destinations, will talk about riding in Wisconsin’s Driftless Area at 2:00 p.m. Sat. World adventurer Phil Freeman, MotoQuest, will discuss motorcycle travel in “Alaska and Beyond” at 3:00 p.m. Sat. and 2:00 p.m. Sun. Mary Pagel, Damsel in Defense, will talk about self-defense techniques for women riders at 1:00 p.m. Sun. Local celebrities will also make an appearance at the EXPO. Brian Zepp, KQRS-Radio, will broadcast live from the EXPO from 3:00-5:00 p.m. Sat. Dave Dahl, KSTP Chief Meteorologist, will be on hand Sunday to meet and greet bikers from noon-2:00 p.m. Sun. He will also kick off Sunday’s noon fashion show. The 93X Girls will also make an appearance. A fashion show will be held at noon each day, and live bands will perform both days. Bad Girlfriends will play from 4:00-7:00 p.m. Sat. Johntourage will perform both days from 1:00-3:00 p.m. 23rd Hour will play from 10:00 a.m. until noon on Sat. and 11:00-a.m.-1:00 p.m. Sun. The Motorcycle Life Expo begins at 9:00 a.m. each day. Tickets are $10 if purchased online at www.motorcyclelifeexpo.com, or $13 at the door. Children under 12 are admitted free. See you there! Motorcycle (Show) Season Is Here! “Highway to Hell” blasted out of the speakers of a Victory Magnum motorcycle and ricocheted off the walls of the Minneapolis Convention Center on Sunday morning, certainly a different message than what I would have heard at church! 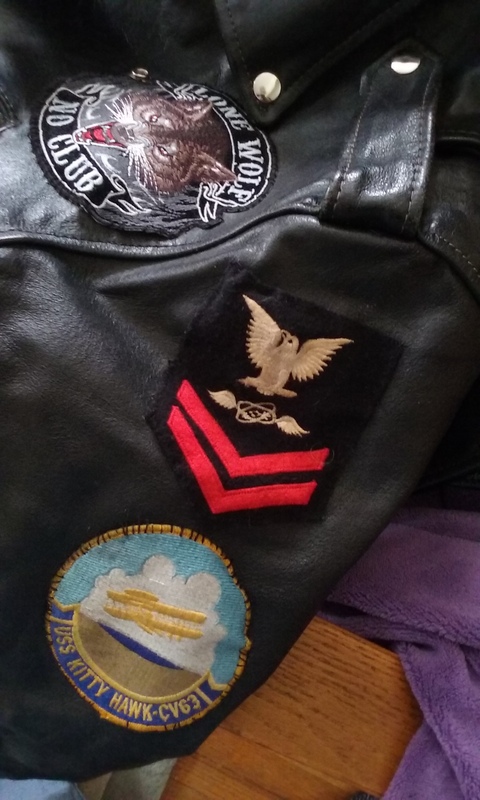 My husband and I went downtown to the Progressive International Motorcycle Show to sniff the 2015 bikes and mingle with the leather-jacket crowd. IMS is all about the bikes. There’s something there for every adrenaline-addicted speed demon from sporty Ducatis to heavy-duty Harley cruisers. Even if you’re like me and don’t have a motorcycle endorsement on your driver’s license, it’s fun to thow a leg over and get a driver’s perspective. It annoys me that so many really cool-looking bikes are not built to accommodate women riders. After all, women now make up 25 percent of the motorcycle market, and it’s growing. It’s frustrating to find a bike that looks like it’s just my size, only to find out it’s too tall, or the gas tank is so wide it threatens to crack my pelvis like turkey wishbone. C’mon, motorcycle engineers! Do something for the ladies! The next show in the Twin Cities area is the Motorcylce Life Expo at Canterbury Park in Shakopee, Minn., Feb. 28-Mar. 1. While IMS is all about the bikes, MLE is about what you do with your motorcycle after you’ve acquired it. That includes not just customization, but places to ride. If you want to expand your horizons beyond Sturgis, South Dakota, it’s the show to visit. It runs from 10:00 a.m. to 4:00 p.m. both days. I’ll be there, hawking copies of Ride Minnesota. Recently, I had the joy of talking about Ride Minnesota with radio talk show host Kevin Hunter. It was a fun interview. Take a listen! I hope you enjoy it. The Business Forum Show highlights small businesses throughout the state. Thank you, Kevin! The motorcycle season is short in Minnesota. 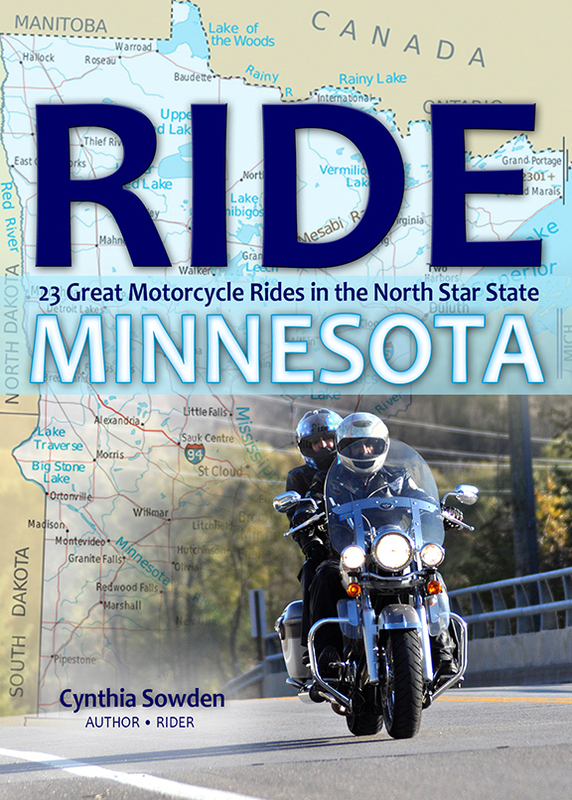 It says so right on the back cover of my book, Ride Minnesota. Now that we’ve left winter behind, we’re in the rainy season when thunderstorms can crop up just in time for rush hour and dampen your ride home from work. A lot of people ride their motorcycles to work. I temped recently at Thomson Reuters in Eagan and entire sections of the parking lots (there are multiple lots) were designated solely for motorcycles. It’s nice to have a motorcycle-friendly employer. Motorcycling to work not only saves money on gas, it also gets you there sooner, thanks to the diamond lanes on metro freeways. Still, there’s nothing like riding two-lane blacktop on a sunny day. Discovering what’s just beyond that next curve lends an air of mystery to a ride, whether it’s another set of curves, an uphill climb or a cow grazing peacefully in a nearby pasture. Today’s gray, rainy weather gives me another chance to work on building my retail network. Here’s a list of places where you can purchase Ride Minnesota. Here’s to sunnier days ahead! Back in 1963, Honda Motorcycles ran an advertising campaign that proclaimed, “You meet the nicest people on a Honda.” I’d like to amend that to “You meet the nicest people on a motorcycle.” Period. It doesn’t matter the make or the model, bikers are some of the nicest people I’ve run across in a long time. 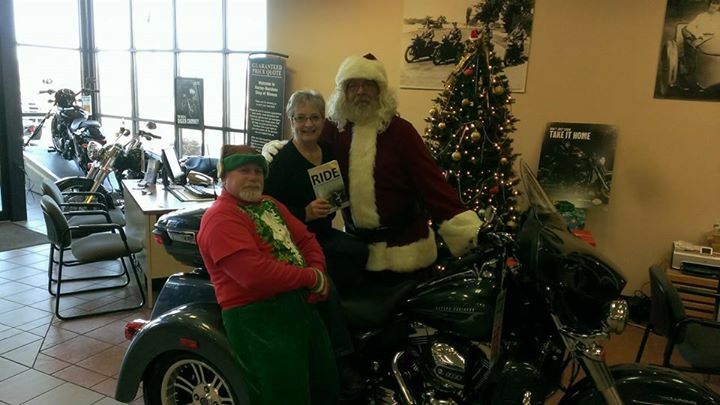 I stopped out at Indian Motorcycles in St. Paul today and dropped off some copies of Ride Minnesota. Although owner Art Welch wasn’t interested stocking the book, he has graciously allowed me to snag a little counter space in his beautiful store. Can you believe it, almost every motorcycle on his show floor has been sold? There’s a lot of pent-up demand for Indians (Polaris has done a good job of marketing them). I hope the long winter and pent-up feelings extend into book sales, too. I also stopped next door at St. Paul Harley Davidson. The folks there haven’t yet decided whether or not they’ll take the book, but John in the parts department invited me to a seminar on motorcycle touring that he’s giving in April. I’m already booked that day, but I appreciate invitation and the enthusiasm. In fact, so many people involved in motorcycling have been so helpful and encouraging. I saw some bikers on the road today, and there were quite a number of folks buying parts and new batteries for their bikes to get ready for riding season. The temperature hovered around 45 degrees, but the weather was an ever-changing mixture of sleet, snow, sunshine. It’s the annual wresting match between spring and winter in Minnesota. Still, it won’t be long until the rumble of a well-tuned motorcycle is heard again. I am so sick of this long Minnesota winter I could chew roofing nails! It definitely was a lot more fun when I was a kid and played in the snow and didn’t worry about breaking my bones. Ah, but there are signs of spring, despite below-zero temperatures (at the end of February? Ya gotta be kidding me!). The first sign is a review of Ride Minnesota in the March issue of Thunder Press, a tabloid that reaches some 60-70-80,000 Harley Davidson owners. I can’t wait to see it. 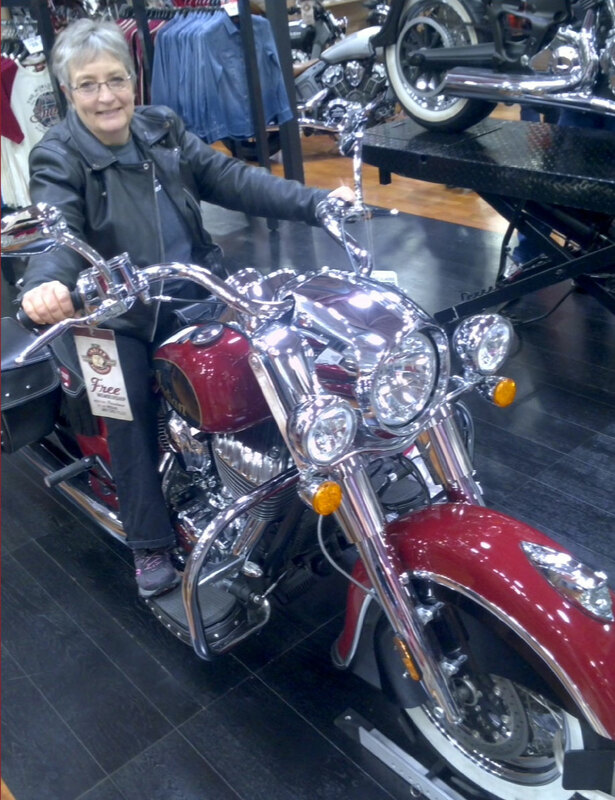 As a result of that review, I received a call from Audrey Johnson, who organized the Motorcycle Life Expo that Ralph and I attended earlier this month (in a snowstorm). She’s got a booth at the upcoming Donnie Smith Motorcycle Show at the St. Paul River Centre, and asked me if I’d like to join her and sell my book at her booth. Would I! I’m already checking my booth supplies. I think I’ll need to order more books. The third sign is an invitation to do a reading of Ride Minnesota at Eat My Words Bookstore here in “Nordeast” Minneapolis. I’m so excited that Scott and his son, Peter, are hosting this event. It happens at 3:00 p.m. on March 22. The store already has copies of the book on consignment, but I’ll bring more copies. I’m revving my book marketing engine. By the time the snow melts and Ralph and I can get on the highways, it’ll be in high gear. Record snow depth on Michigan’s Keweenaw Peninsula is 139 inches. Once you’ve sold the first 100 copies of your book to your family and friends, you have to work a little harder. I just received notice from Amazon that the book I ordered, “Beyond the Bookstore,” has shipped. It’s supposed to be filled with ideas for unconventional ways and means of selling books. I’ve been doing some of that on my own, making appearances at motorcycle dealerships with a saddlebag full of copies of Ride Minnesota. Showing up at unexpected places is a fun way to market a product, if somewhat time-consuming. In the next few weeks, I’ll be at Northway Sports (September 28), the Twin Cities Book Festival (October 13, sponsored by Rain Taxi) and the Home Improvement & Design Expo (October 19-20). I have no idea what to expect from the last one, but Northway is going to loan me a hot new motorcycle to attract attention and keep me company in the booth. Showing up at unexpected places reminds me somewhat of motorcycle touring, when you often find things at unexpected places. This summer Ralph and I took the Lake Superior Circle Tour. 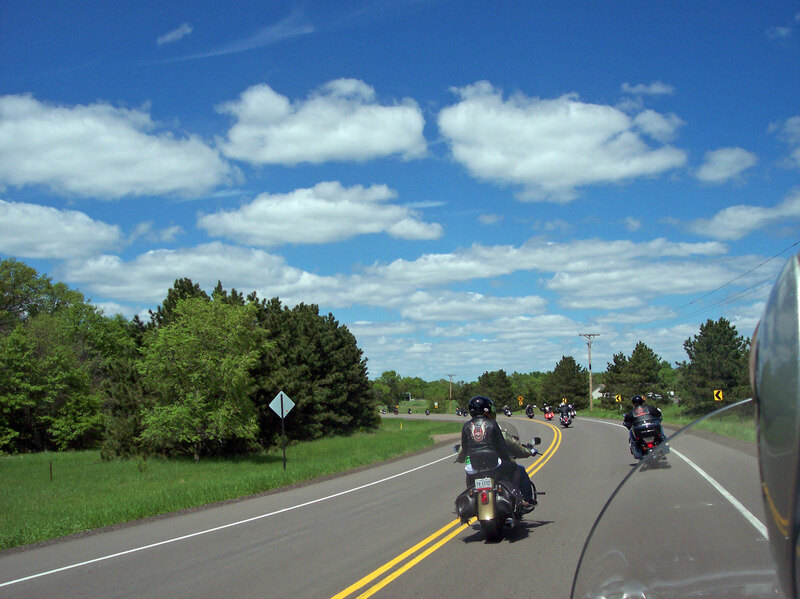 One of the great places to ride along the way is the Keweenaw Peninsula in Upper Michigan. 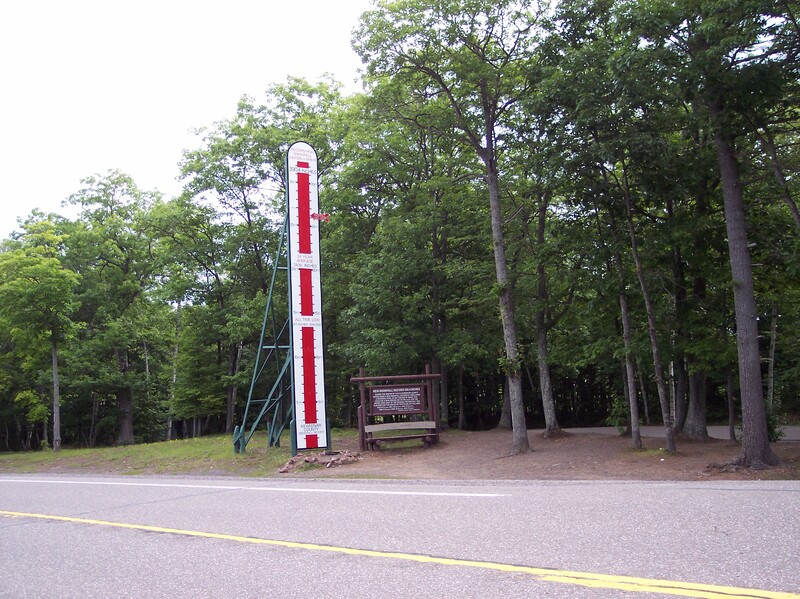 That’s where we came across this gigantic thermometer that measures snow depth in the area. It’s something we never expected to see. The record snow depth, by the way, is 139 inches. I’m damned glad I didn’t have to shovel it.